I think one of the best things about being a surfer is the connection it gives us to nature. Many surfers are concerned about the ocean, sustainability and the global environment, so it’s not surprising to see the amount of people contributing to make a difference. Monyca and Ola are a wonderful representation of surfers making a small but important lifestyle change. This has taken form as Olamana Organics, a fruit farm on Maui’s east side that the Eleograms bought in 2013 and now call home. Monyca and Ola both take amazing pride in their fruit farm. They live in a humble home on the property that gets most of its electricity from solar panels, and continue to expand the farm’s yield. “Ola’s put in 100 trees since we bought the property,” says Monyca. Fruits like tangelos, Tahitian limes, lychee, longgongs, oranges, avocados, lemons, mangos, soursops, Cuban red bananas, apple bananas and rollineas can all be found growing abundantly at Olamana Organics, among many other exotic trees and plants. 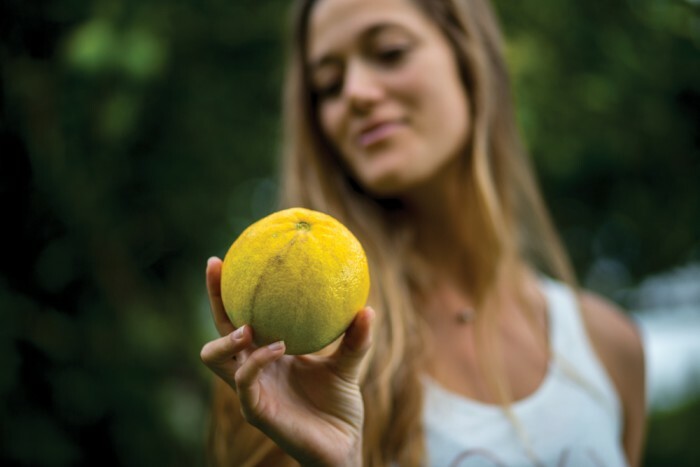 Olamana Organics is also widely known for their amazing oranges, which come from trees that are nearly 30 years old. “It’s a really big spot for people in Hana to come and get their oranges, it’s been around for a really long time,” Ola describes. Aside from selling at the Upcountry Farmers Market, Ola & Monyca also provide their harvest to a restaurant and a food truck in Hana and have a fruit stand on their property, which they pack with produce in the winter months. “We try to load it for all the people around here,” Ola says, solidifying he and his wife’s motto of staying true to their local, tight-knit community roots.